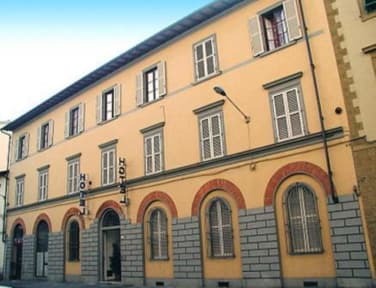 The hotel is located a few steps from the most important museums and monuments and is easily accessible from the boulevards and ring roads surrounding the city. It is located in a quiet and lovely garden, situated in a quiet residential area of ​​Florence. For over 50 years our family welcome guests with a friendly welcome in a warm atmosphere.The rooms are spacious and bright all with private bathrooms, some with the preparation for the disabled, others have air conditioning all with satellite TV, most have private bathrooms. The hotel also has some areas in common, such as a bar, a tea room with TV and comfortable lodge for breakfast. Loved the hotel ... great location , friendly and helpful staff... just perfect!! It was awesome nice staff and close to the main points in the city. The hotel offers free wifi, but the wifi doesn't reach the rooms so you must sit in the common area. A hotel advertising wifi should have a strong enough signal to reach the room because it's not really free you're paying for it with the price of the room, so they should make their wifi better or remove it from the advertisement. Aside from this, it was a good hotel, a good value for the money and within walking distance of attractions.